B&W 685 S2 review | What Hi-Fi? It’s tough being king. It’s only a matter of time before somebody makes a move for the crown, and then you have to defend your honour. So it was for the original Bowers & Wilkins 685s, which blew our socks off nearly 10 years ago, firmly establishing themselves as venerable favourites before eventually being bested. Then came the 685 S2s, and B&W once again found itself at the top of its price range. They have since won two Awards, including the coveted Product of the Year. And yet they never get to sit still before they are hauled into a testing room for another fight. It's taken a lot to beat them, for they are made of sterner stuff than their predecessors and incorporate technologies taken from B&W’s high-end speakers. But now some new kids on the block - most noticeably from Dynaudio and Quad - have knocked them off their perch. The headline act here is the decoupled reinforced dome tweeter. The 25mm aluminium dome in the 685 S2 is reinforced with a thicker metal ring to make the tweeter stronger and better damped – a technology handed down from B&W’s premium CM10 floorstanding speakers – and ensures a higher degree of clarity and accuracy in the upper ranges. The tweeter assembly is suspended in a ring of soft gel, keeping it isolated from any cabinet vibrations brought about by the mid-bass driver. This series marks the first time that B&W has used such mechanical decoupling for a tweeter in a cabinet loudspeaker. B&W has finally covered up the fragile dome with a protective grille mesh, which helps with dispersion too. Elsewhere, the 16.5cm Kevlar mid/bass driver remains mostly the same. The bullet-shaped phase plug of the previous generation is replaced with a mushroom-shaped ‘dust cap’ derived from the high-end B&W PM1 speakers, which further damps the driver down at certain frequencies. While the speakers are solidly built, we can’t help but wish for a more premium-quality finish. We noted in 2014 that the 685s look and feel rather plain, especially considering the price, and our feelings haven’t changed. 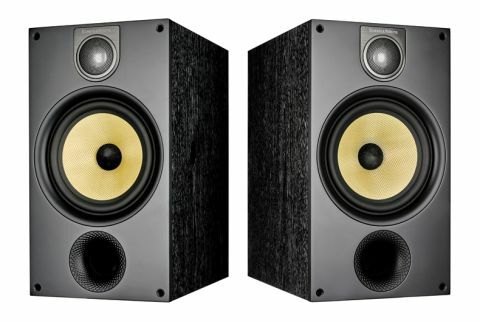 It doesn’t help the B&W’s case that the similarly priced Quad S-1 and Dynaudio Emit M10 both have much nicer finishes. But enough of that – how do the B&Ws actually sound? In a word: good. Right from the start, the 685s burst to life with a powerful, clear and agile sound. These are hugely talented and enjoyable speakers, and a definite step up from their predecessors. The sense of scale is massive, especially coming from relatively compact standmounters. The soundstage is wide and deep, enveloping you in a richly detailed, dynamic performance, whether you’re playing Aerosmith, Lorde or a Hans Zimmer soundtrack. The bass is pleasingly deep and powerful. Play Led Zeppelin’s Whole Lotta Love and the bass notes are so rich that it almost feels like there’s a subwoofer in the room. All the technology tweaks seem to have paid off as well, as the 685s sound clean and precise. They can also go extremely loud with little obvious distortion – we rarely have this much fun listening to music so loudly in our listening rooms. Get them into your home and we think you’ll agree. But there is the competition to consider, and while the B&Ws are talented in their own right, they face tough competition from their latest batch of rivals. Take the Quad S-1s, for instance. While they certainly cannot offer the B&Ws’ massive scale and large-scale dynamics, they can counter with great subtlety which goes from the midrange right through to the higher reaches of treble. They handle voices with greater nuance. Then there are the Dynaudio Emit M10s. They match the B&Ws in energy (if not in scale), while superior timing, cohesion and detail make for a more emotional and engaging performance. They’re entertaining, and their sheer power, vigorous dynamics and detail retrieval will impress you. But they are no longer at the top and so, begrudgingly, we have to take away that fifth star.